Today, I would like to talk about palm wine. Have you ever tasted palm wine? hummmmmh so sweet! So good! so delicious! or rather palmilicious! Palm wine or white wine made in Africa or raffia wine is wine from the sap of the palm or coconut tree. It is actually white in color, not transparent like its European counterpart. Palm wine sap is gathered in two ways. The first: A tapper extracts and collects the sap from the tree by making a triangular cut onto the raffia tree just like during the harvest of hevea: a receptacle is attached to the tree where the cut was made, and the sap can thus be collected. The second way involves cutting down the tree and allowing it to lie for two weeks. After, a rectangular well is cut in it. At this stage, a bamboo tube is inserted into the well to drain the sap as it collects. 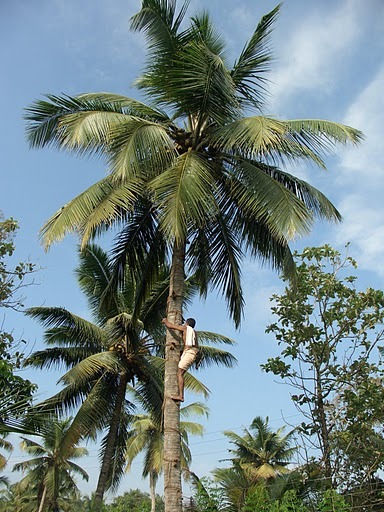 The quantity of sap that is extracted from one palm tree depends on the mode of extraction, the palm species, season and the fertility of the soil. The white liquid that comes out is at first very sweet and non-alcoholic: this is what we as kids would love to drink. Fermentation begins naturally and immediately after collection. After fermentation, the liquid becomes alcoholic and has some sourness and acidity to it. It could sometime happen that we would drink it two – three hours after collection, and it would still be good, but would have a sour after-taste to it. After one day, it is fully alcoholic, and more than one kid has certainly fallen to it! In the old days, and at night in the village, children and adults will sit around the fire to hear storytelling from a village elder while enjoying some palm wine, grilled corn or grilled safou! It is drank at celebrations, weddings, etc… Chinua Achebe mentions palm wine in his novel “Things Fall Apart“, and it is the title of the novel by Amos Tutuola “The Palm Wine Drinkard“. In Cameroon, it is harvested from raffia palm tree, and collected into a container communally called ‘dame-jeanne’. The traditional version of this container is also made from raffia or African bamboo wood! Palm wine is often called ‘matango‘ in the Cameroonian slang. What is it called in your country? Please enjoy this great video about the harvesting of palm wine from Cameroon! I also liked this lady’s description of her first taste of palm wine: Palm wine drinkards. In Ghana it is called Akpeteshie! Thank you for the great article. 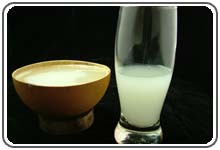 palm wine – both from oil palm tree and raffia palm tree is called “ukọt nsuñ” in Ibibio and “mmin efik” in Efik languages. That was a truly fun article. What a really fun piece..
You can check out my blog too – we are quite similar in interests as it seems. Keep it going, thanks!! I like your blog. I will be subscribing. Keep it going… Thanks for sharing! Yes, I’ve tried palm wine but long time ago! Enjoyed discovering your blog and looking forward to following it.